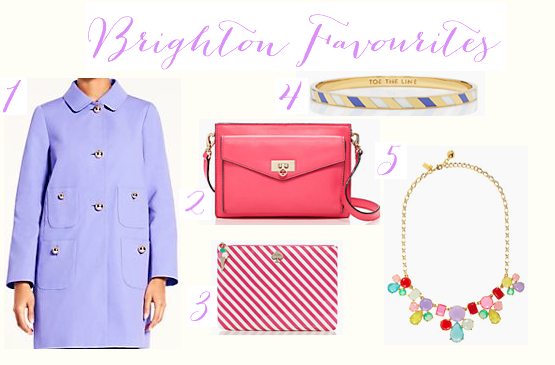 As we saw today, the first stop on the Kate Spade year of "places to go, people to see" is Brighton, England. While I am absolutely loving the pretty pastel, bubblegum colours I am even more excited for her next stops. Going by my 2014 KSNY agenda (seen here), in February Kate is headed to Paris, in March she is headed to Capri, and in April she is headed to Monaco (and the subsequent months get even more exotic). The fact that I am travelling to some of Kate's destinations this May is really adding to my excitement for this spring collection! Today I found myself looking back on pictures from the New York fashion week show to get another sneak peak of what's to come! I adore the romantic pieces from Paris, the bright and fruity styles from Capri, and the racing stripes that scream Monaco Grand Prix! I can say one thing, I'll definitely be adhering to the #travelcolorfully this May (even if it contradicts my spelling of the word colourfully).